Bomanite Licensee, Harrington Bomanite Corp. installed multiple colors of Bomanite Color Hardener to give this splash pad a fun and entertaining feel. 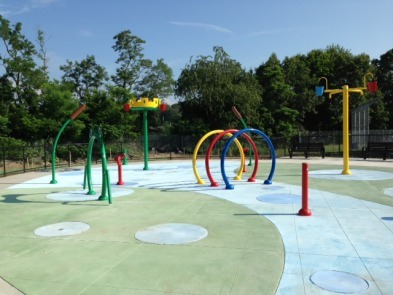 The splash pad at Watson Park was designed by Warner Larson Landscape Architects of Boston. Working with the Landscape Architect, Harrington Bomanite was able to suggest the best Bomanite products and system for the design to come alive. Bomanite Color Hardener provides the durability and strength needed to withstand climate changes. River, in the neighborhood of East Braintree, where he had lived. For nearly half a century, residents squabbled over where the pool should go, while Petersen’s gift sat in the bank and grew to about $2 million. Decades later, Petersen’s dream has been realized, at least in part. On April 2, Braintree officials broke ground on a “splash pad” at Watson Park that has been named after Petersen. The town is also planning to build a pool and ice rink in honor of Petersen at Braintree High School with the remainder of the money.